Kids' Book Review: Review: Where's Dad Hiding? 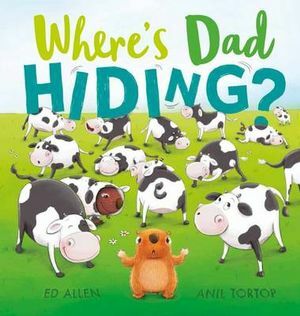 Where's Dad Hiding by Ed Allen and Anil Tortop, is a delightful humourous hide-and-seek story. Dad is really good at this game. As little wombat searches for Dad your toddlers will giggle in delight. They will think that they are so clever as they find Dad's hiding spots, especially when he is hiding in plain sight and little wombat cannot find him but they can. Where and how does Dad hide? Dad disguises himself as a cow. Dad hides behind a tree. Dad hides up high with birds. Could Dad hiding be on the bus? In this story children will find many animals that they will know. They will see farm animals like, cows and ducks. In the forest they will discover Australian animals; possums, a koala and kangaroos. On the bus, children can find a few zoo animals too. But what animal will little wombat disturb on the beach? Like all fabulous illustrators Tortop has included other things to find in her bright and colourful illustrations. Can you find a little mouse that follows the game of hide-and-seek from page to page? Keep an eye out for the little sheep being chased by a dog like wolf. Plus there are lots of little insects hiding in the forest, including my favourite one, the ladybug. Little wombat finally finds Dad on the last double page spread of the book. However, the game of hide-and-seek is often played with more than two players so now little wombat needs to find out where Mum hiding. If you liked this Ed Allen story then read more of his stories; 10 Clumsy Emus, Dear Mum I Love You and Dear Dad I Want to be Just Like You.